So you have always had a hankering for a property in Italy but for whatever reason you don’t want to spend too much. Added to that, you aren’t ready to take on too much land and responsibility and would much prefer something that you can just lock ‘n’ leave. Something with a couple of bedrooms and maybe even a little terrace on which to sit. How about a little Tuscan town house or a flat in pretty Umbrian market town then? Purchasing a property of this type is perfect for anyone who prefers to pop out for breakfast and take part in the lovely early morning bustle that is so very enjoyable and so typically Italian. Also, it isn’t a major drama if you forget to buy the milk/some chocolate/cigarettes/beer/wine/shoes. Well maybe not shoes, but it is nice to have the opportunity if you feel the need! The Anghiari Townhouse is ready to walk into. Recently restored, everything is new. The plumbing, the electrics, the drainage. EVERYTHING. Only steps away from the main square of this pretty Tuscan town, this one bedroom property is in a quiet little street and overlooks someone else’s garden. It doesn’t have any outside space but that, of course, reflects in the price which was recently reduced. Casa Amorino is in Cortona. Say no more. Famous for being ‘Under the Tuscan Sun’, Cortona is probably one of the most well-known and well-loved cities in Tuscany, if not in Italy itself. Amazingly, this property is on one level and is stair free despite being on the fourth floor of a palazzo. How can that be possible I hear you ask? Well I’ll tell you! Access to the apartment is from the ground floor at the rear of the property, remember Cortona is on a hill. Not only lovely, but magical too. Casa Pescaia is also in Cortona and has a garden. This glamourous property has been designed and restored with attention to every, little detail. It really is a stunner. 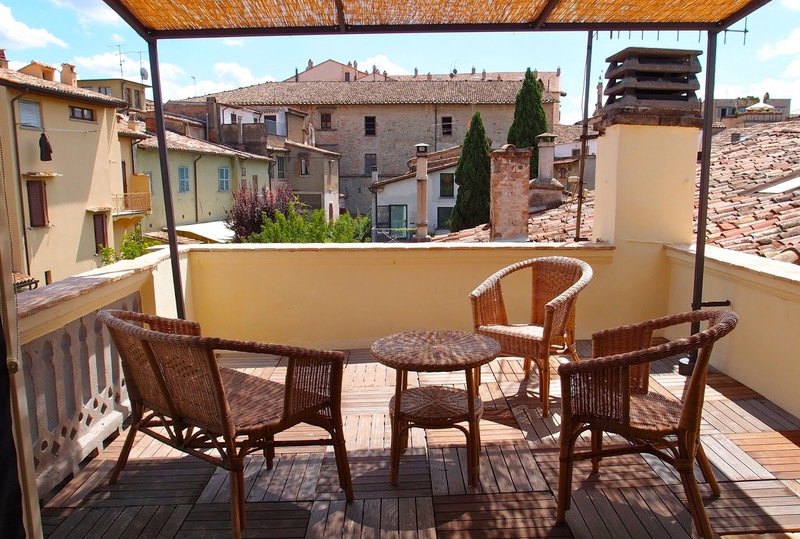 Moving to Umbria and with a more accessible price tag, Casceri is a well renovated top floor apartment that requires sturdy legs because of the stairs, BUT, the pay-off is the pretty roof top terrace. Also in Città di Castello and with two terraces, Guelfucci is larger and also on the top floor of a lovely old palazzo. Take your pick! Call us for more information on properties in Italian towns.